This Biohazard Zombie Glo-Mouth is the piece de resistance when it comes to creating an impressive radioactive or toxic zombie look. Nothing compares to it, especially when you consider that this prop makes your mouth glow! 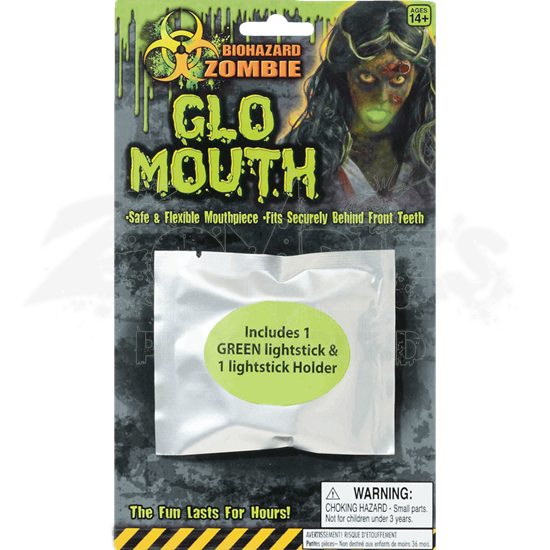 Each pack includes one small glow stick and one glow stick holder, which can be safely positioned and secured behind the front teeth. Once activated, this glow stick will cast an eerie green glow throughout your mouth, similar in fashion to the classic depiction of radioactive material. The mouthpiece is safe and flexible, and the glow stick will last for hours before it gradually dims and fades. Gory wounds, grisly injuries, excellent make-up, and awesome props all pale in comparison to this simple Biohazard Zombie Glo-Mouth, all because the effect of a radioactive zombies mouth actually glowing is just that impressive and that awesome to see.